Builder: G. Simpson & Co. I often start out with the idea of writing a brief post but it never seems to turn out that way! It’s a short one this time, though, on a lovely little Edwardian number that has an impressive street presence despite its small scale. It’s on the corner of Bond and Police streets, in the Warehouse Precinct. 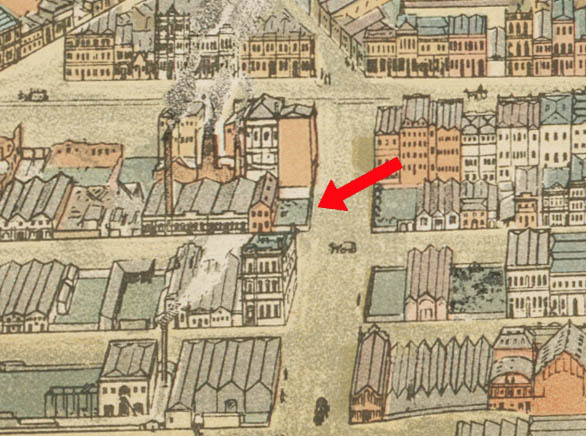 In the early 1870s a modest two-storey brick building was built on the southern portion of the section, with the corner portion left undeveloped as a yard. These were the premises of the builder James Gore, and then his sons Charles and Walter Gore, before they became the tea store and blending rooms of Rattray & Son in 1891. In 1895 they were taken over by the large building supplies firm Thomson Bridger & Co., and the yard was used for the storage of timber and iron. The company had further stores and factory buildings on adjoining sections to the south, where it succeeded Guthrie & Larnach. W.J. Prictor’s detailed and reliable perspective drawing of 1898 shows the site still much as it was in the 1870s, but with some additions to the old buildings. 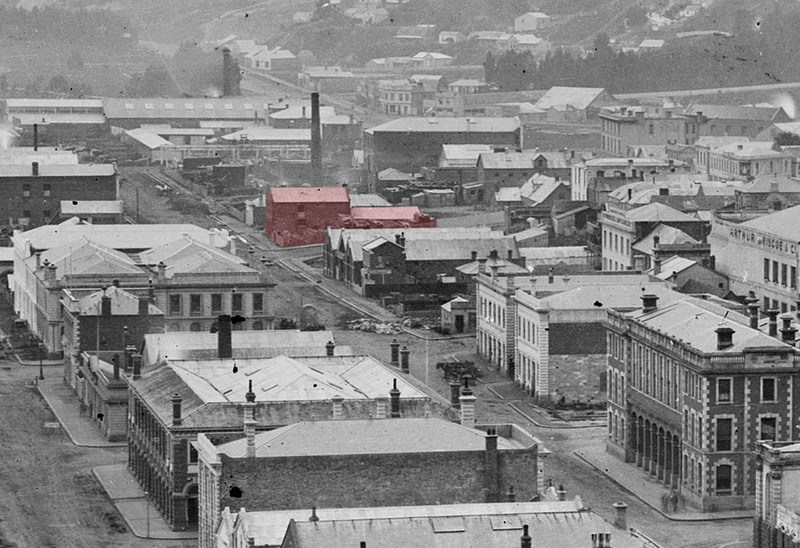 The site (highlighted in red) as it appeared in 1874. Detail from Burton Bros photograph, ref: Te Papa C.012064. The site as it appeared about 1898, little changed from its state in the 1870s. Detail from W.J. Prictor plan, ref: Alexander Turnbull Library MapColl 834.5292ap 1898. The building on the site today was put up for J.W. Swift & Co., wool brokers and shipping agents. The architects were Mason & Wales and the builder George Simpson, and the building was under construction in May 1905. The street elevations are richly treated in the Renaissance Revival style with a prominent cornice, extensive rustication, and Corinthian capitals. The larger Sidey warehouse on the diagonally opposite corner (designed by James Louis Salmond in 1907) is similarly treated. 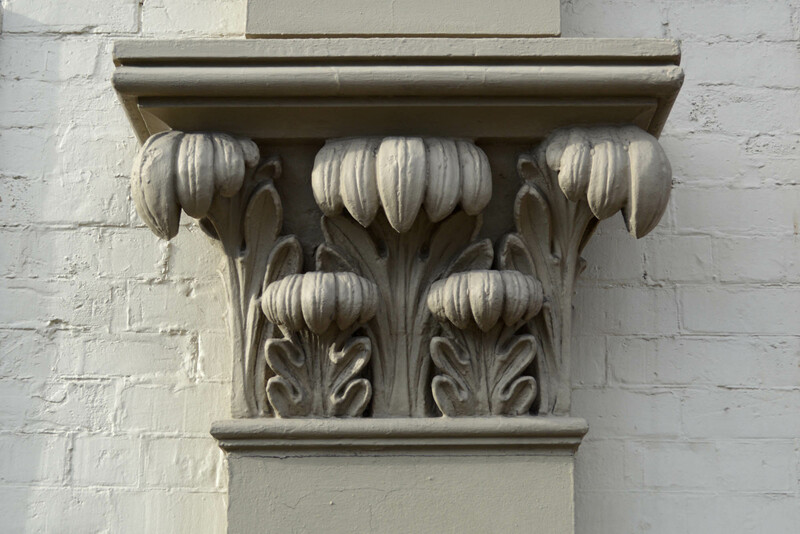 Among other things, the combination of exposed (though now painted) brickwork with the particular style of rustication are giveaways that these are Edwardian rather than Victorian facades. Swift & Co. merged with H.L. Tapley & Co. in 1949 to form the Tapley Swift Shipping Agencies Ltd, but the wool business continued on the site under the J.W. Swift name until about 1958. Around 1958 J.K. Sparrow & Co. moved into the building. This business of merchants and importers started out specialising in insulation, acoustic materials, and telecommunication devices, and also acted as insurance agents. 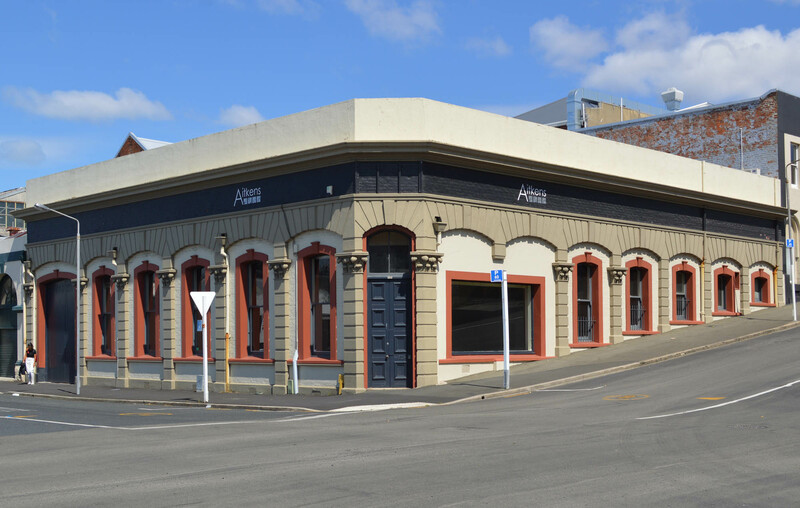 Over time the focus shifted to catering equipment and supplies for the hospitality trade, and in 2003 the business was purchased by a Christchurch-based competitor, Aitkens & Co. Ltd. Aitkens operated from the building until 2014, when they moved their Dunedin operation to Andersons Bay Road. Apart from painting, the exterior hasn’t changed much since the building went up, with the main exception being a clumsily integrated show window installed in the Police Street frontage in 1967. Internal alterations in 2009 included the removal of brick walls and the replacement of timber columns with steel posts. Timber doors to both the shop and the vehicle entrances have survived, which is a happy thing as in small buildings features such as these have a significant influence on the overall character. New owners plan to convert the Bond Street building into apartments, which should be a good fit for the revitalised Warehouse Precinct. Otago Daily Times, 4 March 1891 p.4 (auction notice), 9 January 1900 p.2 (C. & W. Gore), 4 May 1905 p.2 (under construction), 14 August 1905 p.2 (still under construction), 13 April 2004 p.24 (Aitkens). Jones, F. Oliver, ‘Structural Plans’ of the City of Dunedin NZ ‘Ignis et Aqua’ Series, . This entry was posted in Buildings and tagged 1900s, Bond Street, George Simpson, Mason & Wales, Police Street, Renaissance revival, Warehouse Precinct on 1 March 2015 by David Murray. Thanks for your informative posts, more so when one considers the time spent in researching history of each building. Your work also provides important insight into our social, industrial and business history. Thanks. Thank you Garth – it’s always lovely to get some encouragement and hear that people find the work worthwhile. It’s a shame that those unattractive, cheap ads appear now. I know I get them on my posts, I can just never see them (thankfully). Yes, I agree! It’s tempting to pay the $99 per year to get rid of them but over five years that would be nearly $500 and that just seems too much. I’d need to find enough other benefits in the Premium package. Love it. Great stuff to stir the memory banks – just like yesterday for us septonarionas/septofroggians/septemerbabies/septocemias!/or just old buggers born in 1943! 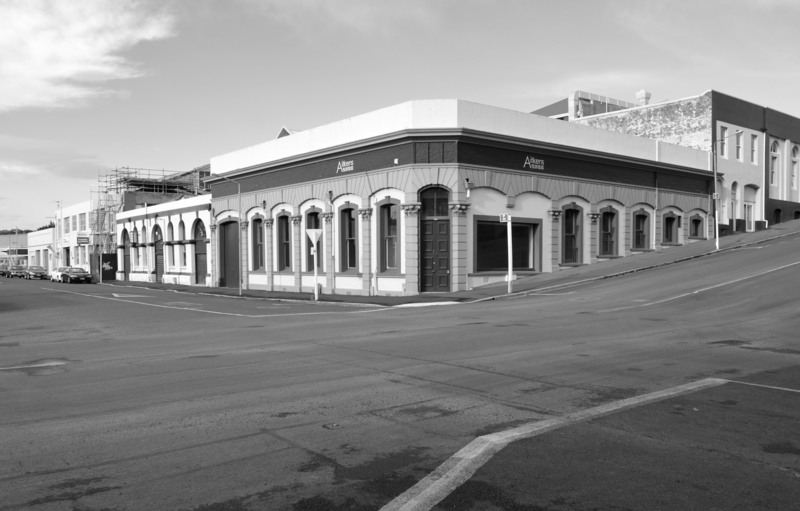 Sweet wee building this one David…I used to walk past it on the way to the 8 ball pool parlour on the upper corner of Princes Street in the late 70s, and it, like most of the warehouse precinct buildings, made me wonder about its original use. Yet again, you’ve entertained and educated me…cheers for that. Thanks Ross – glad to satisfy some of that curiosity. My grandmother, Isabella Ledlie (born 1895) told me that before she married (in April 1919), to a returning Dunedin WWI soldier; she was a typist(e) for ‘Tapley Swift’. I doubt she worked after her marriage (or the birth of her daughter, my mother, in July 1920), so did she in fact work for Swift & Co, and was just using the later name for convenience, or did the firms merge earlier? Thanks for this Blog entry – I’ve known nothing about ‘Tapley Swift’ before now. Ah, thanks, that’s helpful. With that added detail I now suspect she worked for H.L. Tapley Ltd, referred to as ‘Tapley Swift’ when being spoken of in Dunedin in the 1970s. But alas, I’ll probably never know for sure.